Very few nations have had their cultural identity and artistic endeavour as strongly defined by the script of a film as Switzerland. Ever since the release of the British film ‘The Third Man’ nearly seven decades ago, the lines uttered by the character Harry Lime have gone much further than merely reinforcing the (incorrect) birthplace of the cuckoo clock. For better or for worse, these words crystallised the stereotype of the Swiss as citizens leading lives devoid of creativity and enjoyment as they pursue social and political stability. 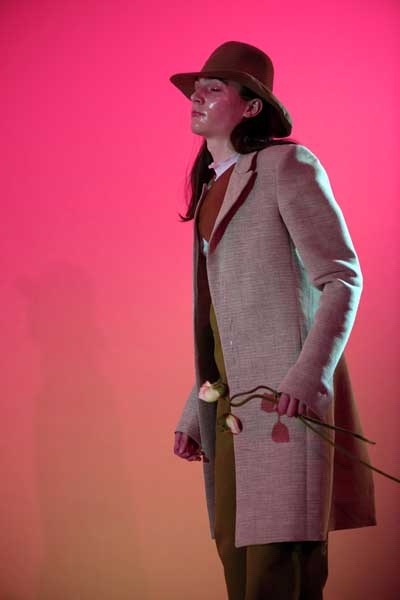 In an attempt to swim against this imposed tide of creative barrenness, Basel’s Institute of Fashion Design revealed the creations of its most recent graduating cohort at a glitzy event on the night of 12 March 2016. The venue chosen for the show was the city’s renowned Museum of Cultures, a building recently redesigned by local architects Herzog & de Meuron that could not be more indicative of the idiosyncratic definition of a nation’s historical and cultural identity as a collective social construct. 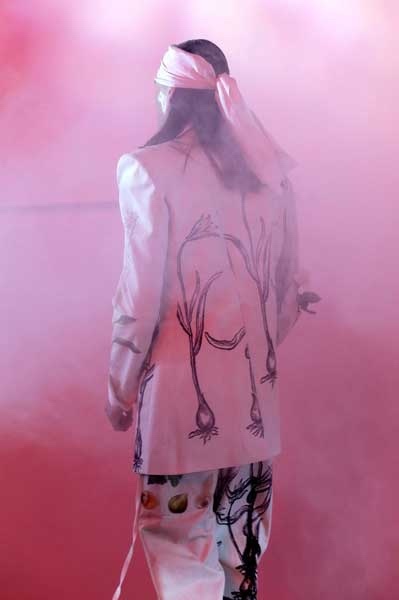 Under the dynamically extended rooftops, from which hang upside-down trees and amongst a myriad of ethnic artefacts from all over the world, 21 students presented the sartorial creations produced at the end of seven semesters of study. 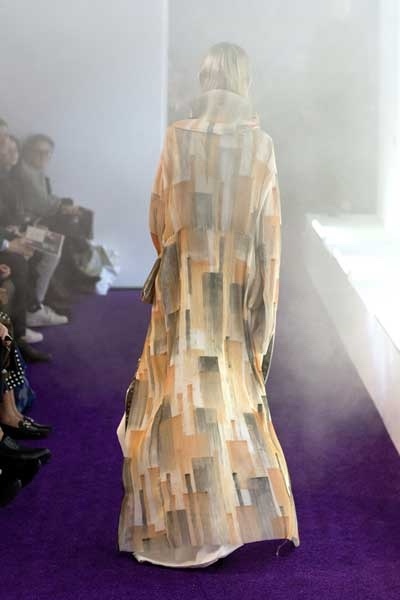 The show, under the creative direction of Priska Morger (professor of fashion design and concept development), intended to illustrate the “polished skills” and “potent vision” of the Institute’s latest graduates while highlighting the importance of fabrication as part of the design process and the sociological significance of fashion. However, the result ended up being a more telling narrative about how the creative and regenerative values of fashion have been replaced by superficial perceptions of social status. In their redefinition of the runway presentation format as a form of haptic visual performance, rather than presenting their definitions of societal evolution and innovation by making, the creations by the young graduates from Basel’s most reputable fashion school were merely indicative of a universal understanding of fashion as perceived by the eye of the camera in outputs for printed magazines, digital editorials or across social media platforms. If the show succeeded in unveiling a new generation of budding fashion designers, the succession of deconstructed looks left the audience wanting to know more about each personal story, passion, influence and inspiration behind each garment and accessory. In many instances, an overemphasis on styling allied to a fervent intent to be perceived as socially alternative and creatively radical ended up precluding most of these budding designers from demonstrating the creative nous and technical skills. Not unexpectedly, when students allowed themselves to follow their passions and instincts, the audience managed to see a glimpse of fashion education at its best. Such occurrence were particularly observed in the resolved designs produced by Tuyet-Trinh Ly and Olaf Tavares Vieira, who stood out for producing successful collections with accomplished technical command and confidence in developing a concept from inspiration to resolution. In her WOW NOW collection, Ly opted to convey a vision of fashion through a range of 3-D printed sunglasses and jewellery pieces adorned with cartoon-inspired typefaces and injected with a dose of Pop art relativistic ambiguity. However, after removing these accessories, the collection revealed a sophisticated respect for the important roles played by volume and texture in the creation of geometric shapes to envelope the body and adjust to natural movements. If once in a while the collection suggested influences by Balenciaga and early Pierre Cardin in terms of volumetric additions, and of Issey Miyake’s investigation into symmetrical textural subtractions, it adopted its own very mature identity in the playful candy-wrap skirts, in the delicate flat pleats and in the elongated shoulder lines. Coming from a somewhat opposite direction, Tavares Vieira offered a carnivalesque definition of menswear that reinterpreted the interactive role of fashion in public and social rituals and ceremonies. In a languid processional pace that allowed fabric and tailoring to define unique silhouettes, the rhythmic succession of looks contrasted with the majority of presentations by bravely setting out its own territory. Trousers made from rough industrial cloth or canvas came in variable widths and lengths with the fabric’s reference codes printed at the very end of a fabric role being used as a design tropes. The variations in length for jackets allowed them be worn either as layered outerwear or as a formal blazers with dystopian expectations of meaning, an approach accentuated by the large floral prints painted in wide brushstrokes on rough cotton, or the circular pattern-cutting effects used throughout. This was a collection conceived by someone who is not only passionate about fashion as a form of social and artistic engagement but who is also very proficient in deconstructing tailoring and in allowing flaws in the materials and in the methods of fabrication to be part of the design. In spite of their achievements, and without detriment to the work of their colleagues, Tuyet-Trinh Ly and Olaf Tavares Vieira’s visible commitment to originality and craft did not stand out as much as it would have been if they had graduated from a fashion school located in London, New York or Milan. Instead, at the show’s after-party in the elegant Café Singer, conversations turned to employment offers and starting dates for new jobs for major fashion labels in Berlin, Paris and Stockholm. A few hours later, as the celebrations drew to a close and students and tutors parted ways from the Marktplatz in the very heart of Basel in different directions and towards varied destinations, the ornate facades of the buildings that have housed social institutions for centuries told quiet stories of generations of prosperity and democratic contentment. As the night fell into a peaceful silence there wasn’t a single cuckoo clock in sight.